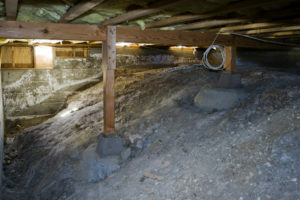 Moisture sources underneath your house contribute to humidity effects inside your home. Water vapor continuously rises, seeping through structural gaps and into the living spaces above. High indoor humidity levels make it harder to maintain temperatures in the comfort zone, creating a clammy, colder environment in winter and a muggy, overly hot feeling in summer. Moisture infiltration also triggers condensation on interior surfaces that can spawn active mold growth, a known trigger of allergic responses in susceptible individuals.